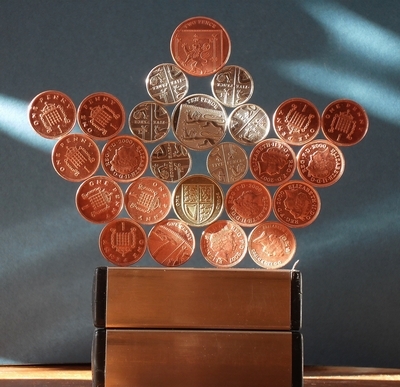 "Investigating Magnetism and Circle Packing - Science Art of Magnetic Coin Tricks" Brunel University UK Download PDF English and Spanish"
"Investigating Magnetism (and Circle Packing) "
4th Edition 2013 - Celebrating 20 years of Real Magnetic Coins in Education. Brunel University, the Institute of Physics and The Royal Institution, UK. "an extraordinary display of magnetic effects ... has all the characteristics needed to interest the public"
Available, absolutely free, to download for home or school use. 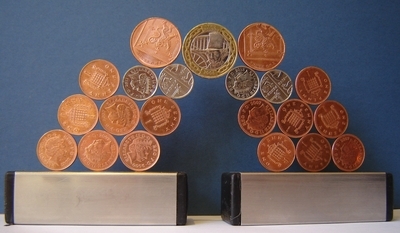 This extended and updated 4th Edition , describes with the help of diagrams the amazing things that can be done with a handful of real magnetic coins of the UK - 20 of 1p, 6 of 5p , 5 of 2p and 1 of 10p and one, or two, ceramic block magnets, of similar propertes to the Magic Penny magnets designed by the Magic Penny Trust. "Brunel Arch" - a non-magnetic coin, here a real UK 2 pound coin featuring a portrait of the engineer, Isambard Kingdom Brunel, is held in place by magnetic coins standing vertically on two Magic Penny magnets. - this is a variation of "Marble Arch " described in the 4th edition and "Lincoln Arch" of the 3rd edition. 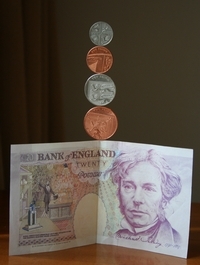 Real UK coins balanced on the edge of a real UK 20 pound note. The reverse of the note features a portrait of Michael Faraday and an engraving based on his work at The Royal Institution in London.